The location, That is the only thing that really favors this hotel. The hotel is modest, the bathrooms are very old, everything is quite old, but really what to expect if it costs really less that the one next door. Rooms were spacious, warm and clean although there was not much sound insulation between the rooms. This was an outstanding hotel I would recommend it to anyone.. the breakfast is great and the rooms are comfy. The staff is very helpful as welll. right in the middle of the resort, I would use this hotel again. location to slopes was fantastic, breakfast included was good. Clean bathrooms, friendly staff. We received a very warm welcome. The room was spacious and there was provision for storing your skis and boots. The food was delicious. Wifi was available in the room. Bars where on your door step. Went up the mountain and the views where breath taking . Lovely helpful and friendly staff and the hotel is very clean and a great location. Mont Blanc This rating is a reflection of how the property compares to the industry standard when it comes to price, facilities and services available. It's based on a self-evaluation by the property. Use this rating to help choose your stay! Located in the center of the Sierra Nevada village of Pradollano, 650 feet from the resort’s central ski elevators, this hotel offers free WiFi, a bar, ski storage, and a 24-hour front desk. Each heated room at this hotel has a TV, safe, and desk, plus a private bathroom with a bath and hairdryer. The hotel offers vending machines, a tour desk, and luggage storage. There is also a games room and billiards table. The Mont Blanc is set next to Plaza de Pradollano, with its many cafes, bars, restaurants and shops. The Sierra Nevada Center for High Performance is just 2,650 feet away. The historic city of Granada is 22 mi away. This property also has one of the top-rated locations in Sierra Nevada! Guests are happier about it compared to other properties in the area. When would you like to stay at Mont Blanc? Heated room with a TV, desk and safe. The private bathroom comes with a hairdryer. This spacious and interior-facing room comes with a TV, a desk and a safe. The private bathroom includes a hairdryer. Please note that this room has no views. This room has no views. House Rules Mont Blanc takes special requests – add in the next step! Mont Blanc accepts these cards and reserves the right to temporarily hold an amount prior to arrival. Rooms are a bit dated, no bedside lights, shower had no curtain so the floor got soaked. Great location, fantastic staff, good food. Very noisy until early hours of the morning with teenagers from school trips partying. Complained to male hotel night staff and got a shrug of the shoulders and they clearly did not want to deal with the situation. Also, very noisy outside at night and early hours with drunks chanting! The entrance and lift areas are dated. Stairs to reception are steep and treads lifting so a bit dangerous in places. Breakfast was very poor, we didn’t have breakfast until 9.45am and there was very little to choose from even though it didn’t finish until 10.30am. Lift unreliable when in ski boots the steep stairs are frightening. Pillow was hard lumpy. Could hear noise from street at night, which could be remedied with double glazing. Also, had I been aware of this problem, I would have requested a higher floor away from the noise. Toilet seat was broken, and bathroom needed refurb as a whole. Room was comfortable and spacious. Restaurant buffet was adequate. Hotel was very “tired” and badly in need of a major refurbishment. Carpets were well worn, tiling in need of regrouting & generally it looked very run down. Location was brilliant & I found the guy in reception excellent - went out his way to answer my many queries! I really did not have contact with any other staff in the hotel.Sierra Nevada is a beautiful little town with numerous cafes, bars, restaurants & interesting shops. 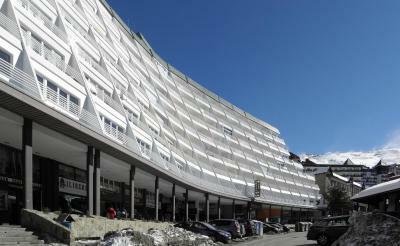 Great Skiing & superb facilities to bring you to the excellent ski slopes.